Our half bathroom downstairs is small. Really small! There is one small corner that I need to find something to hold the necessities. Some extra toilet paper, soap and hand towels. The only problem is it is pretty wedged in between the sink and the toilet. This might just give me the storage I need in the space I actually have! What a great idea! I often think people forget about decorating up! Nice post~great idea. Will have to try this. Amazing! I have the perfect spot for this application in my downstairs bath. Thanks for the great idea! You had me at basket. Hello from your latest follower. L-O-V-E!!!!! Our bathroom is teeny-tiny, so this will be perfect for us! Thanks for posting! I love this! Thanks for the great idea. Thanks for sharing this awesome idea! I would love to know exactly how you did this. Great idea! I'm linking to it at Dollar Store Crafts this weekend. Love them! 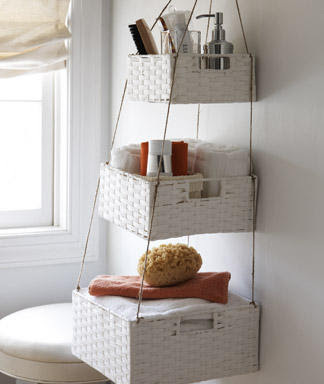 But how in the world did you attach the baskets to each other? Awesome! How do you keep the baskets ftom slipping thru the chain or cord? Thanks! This post is a few years old...but I am wondering the same thing!!! I would love to do this! !